At the heart of Southern home cooking, smoked neck bones and ham hocks are commonly enjoyed with things like beans, potatoes, rice, cabbage as well as in soups and stews where they’re slow-cooked until their smoky, fork-tender meat falls right off. But have you ever had homemade smoked neck bones or ham hocks? Let’s just say you can figure on multiplying the flavor factor by about a hundred and that’ll land you somewhere in the ballpark. I made my homemade chili a couple of weeks ago and it’s always a hit. But this time I thought I’d thrown in a smoked neck bone and wow, it took that chili to a new level! The process for making smoked neck bones and ham hocks is the same but I’m demonstrating the process using neck bones. They are very straightforward and simple to make, it just involves a bit of a wait for the neck bones to marinate in the brine. Once the waiting game is up it’s time to smoke them, and that part is relatively short. 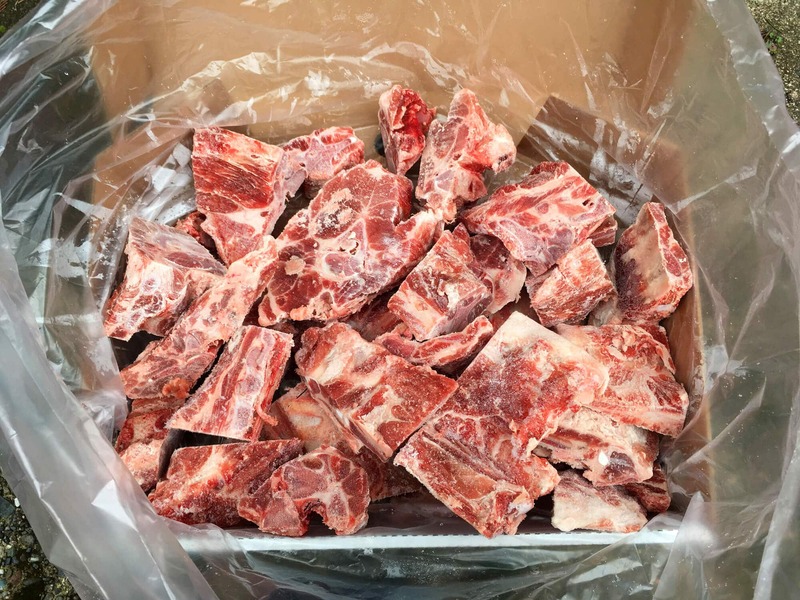 You can get raw neck bones and ham hocks at your local butcher – ask them to set some aside for you. There are also stores in the U.S. like Cash and Carry (where I got the ones I’m using for this batch) that come frozen and at a good price. Add all the brine ingredients to a large bowl and stir until the salt and sugar are dissolved. Divide the neck bones or ham hocks between two gallon ziplock bags and pour in the brine. You can also place the neck bones/ham hocks in a stainless steel or food-grade plastic bucket with a lid to brine in there. Make sure the meat is submerged in the brine. Place the ziplock bags in some kind of a dish to catch any leakage. I’m using baking dishes. Refrigerate for 7 days, turning the bags over to ensure even distribution of the brine. After 7 days of brining, rinse the neck bones or ham hocks and place them on a wire rack, set it on a cookie sheet, and refrigerate uncovered for another 24 hours. This will enable to smoke to better adhere to the meat. Don’t have a smoker? See the recipe box for instructions for oven smoking. 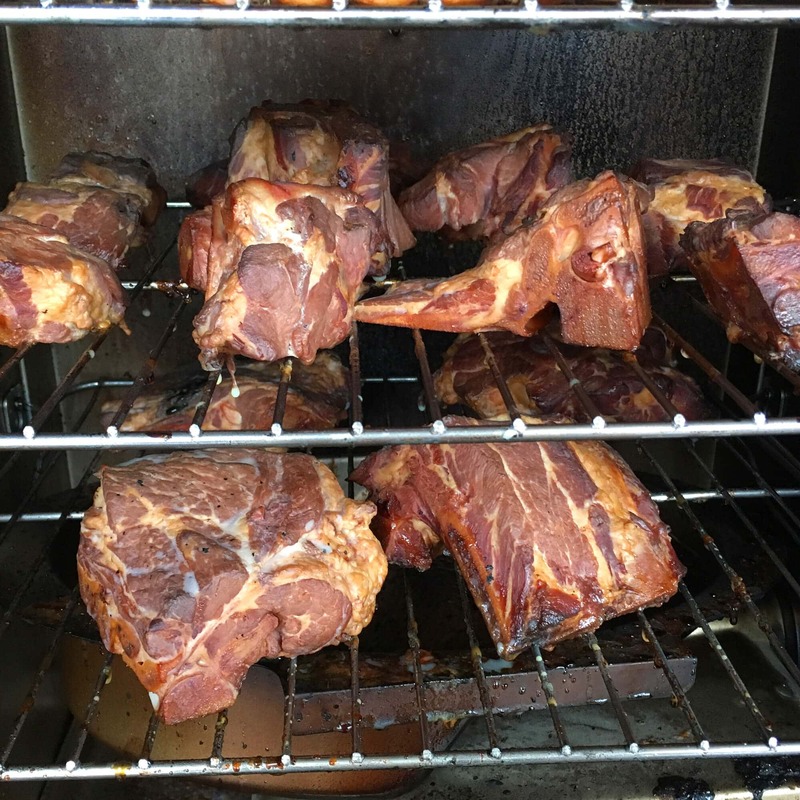 I’m using my Masterbuilt 30″ Digital Electric Smoker. I LOVE this smoker. I really can’t praise it enough. It’s incredibly easy to use, comes with great features and produces terrific results. Check out my full review on this Masterbuilt smoker. 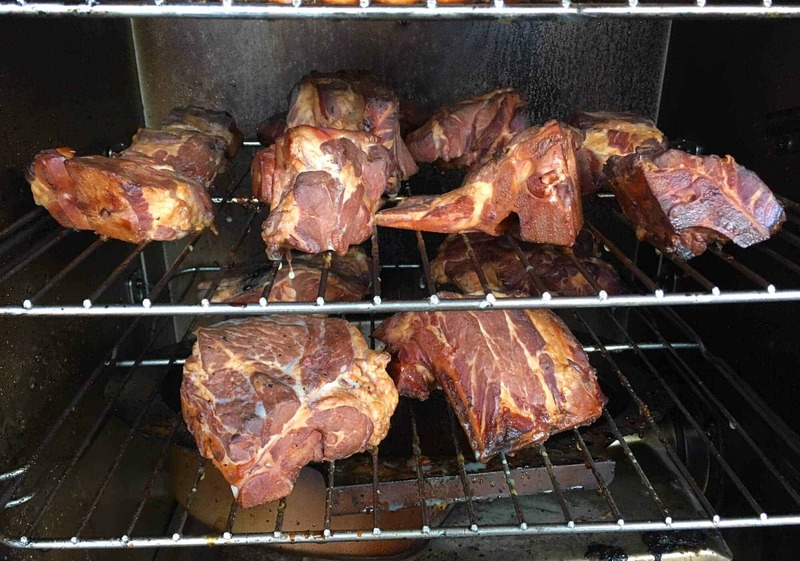 When you’re ready to smoke them, set your smoker to 200 degrees F. Place the neck bones or ham hocks on the smoking grates, making sure they’re not touching each other. Add a couple of handfuls of wood chips to the smoker throughout the smoking process. Hickory wood chips and apple wood chips are both great choices for pork. Smoke until the internal temperature reaches 150 degrees F. You’ll need an instant read thermometer. 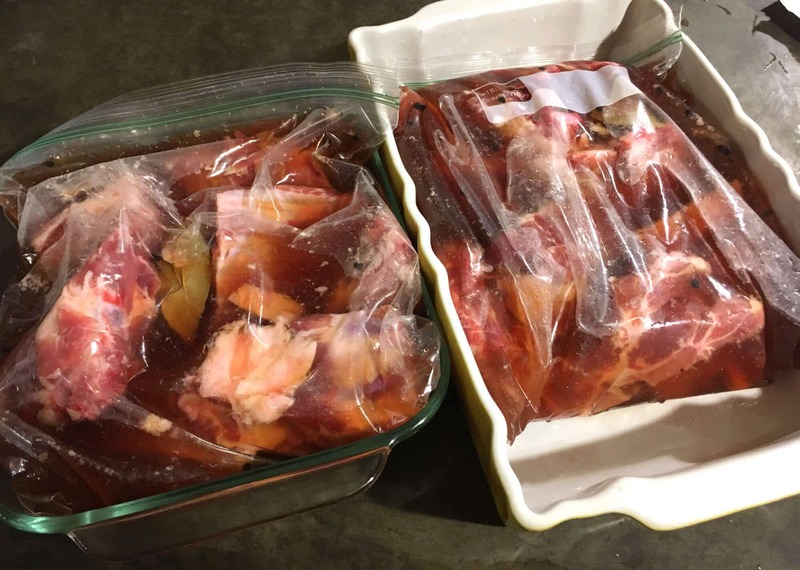 Once done, wrap the smoked neck bones or ham hocks and freeze them for long-term storage or refrigerate them if you’re going to use them within a week. Forget store-bought, smoke your own and enjoy more flavor! 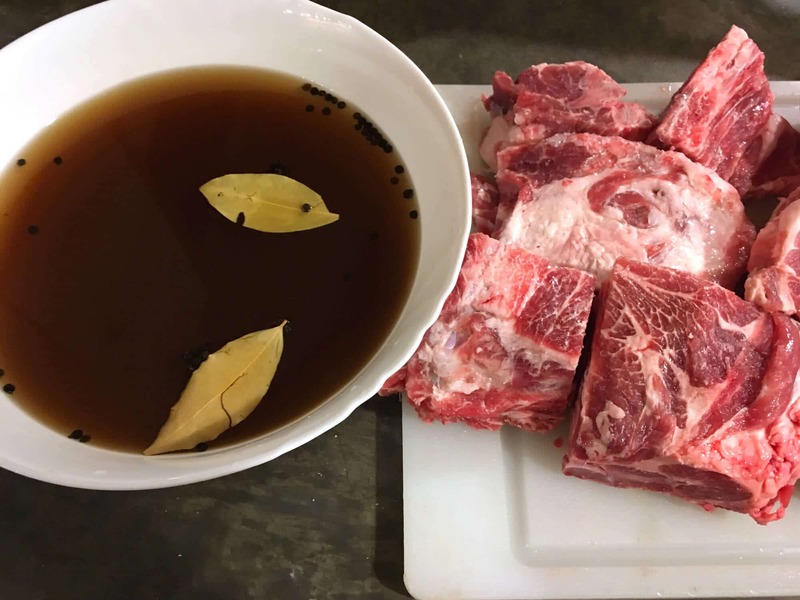 Make the brine by placing all the ingredients, except for the neck bones, in a large bowl and stirring until the salt and sugar are dissolved. 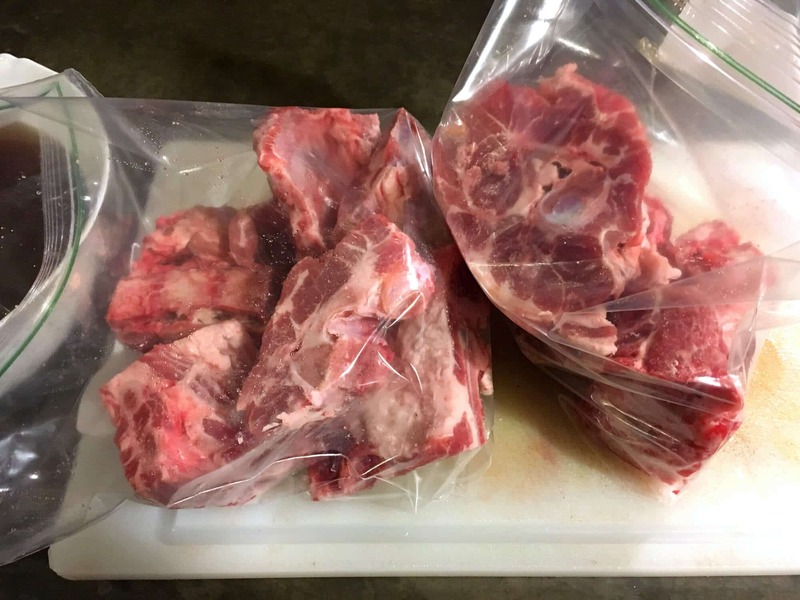 Place the neck bones in a stainless steel or food grade plastic bucket/container with a lid, or divide between 2 gallon ziplock bags, and pour the brine over the neck bones. Cover with lid or close the ziplock bags and place the latter in a large dish to catch any leakage. Make sure the neck bones are covered in the brine. Refrigerate for 7 days, flipping the ziplock bags over each day to ensure even distribution of the brine. After 7 days rinse off the neck bones and place them on a wire rack on a cookie sheet and refrigerate them uncovered for another 24 hours. This will help the smoke to better adhere to the neck bones. Set your smoker to 200 degrees F and place the neck bones or ham hocks on the smoking grates, making sure they're not touching each other. 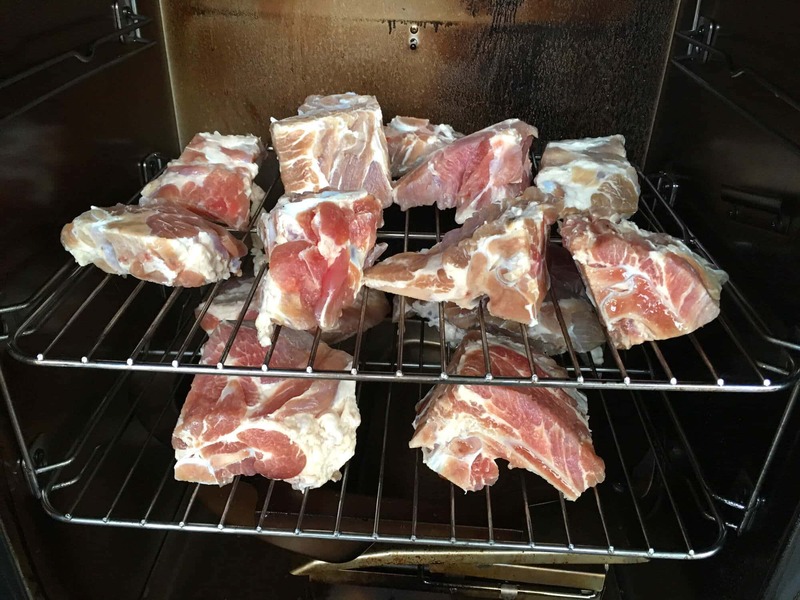 Smoke the neck bones until they've reached an internal temperature of 150 degrees F, adding a handful of wood chips a couple of different times throughout the process. 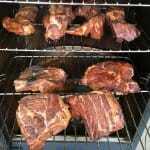 Smoking time will vary depending on the size of the neck bones but you can figure on about 2 hours. Once done, wrap the neck bones and freeze them for long-term storage or refrigerate if you plan on using them within a week. IF YOU DON'T HAVE A SMOKER: You can create a makeshift smoker in your oven. Here's how: Place some wood chips in the bottom of a roasting pan (or something like it) on the bottom shelf of the oven and add just enough water to to the pan to moisten the chips without immersing them in water. Cover the pan with aluminum foil creating a tent at the top where the smoke can come out and circulate around the meat. 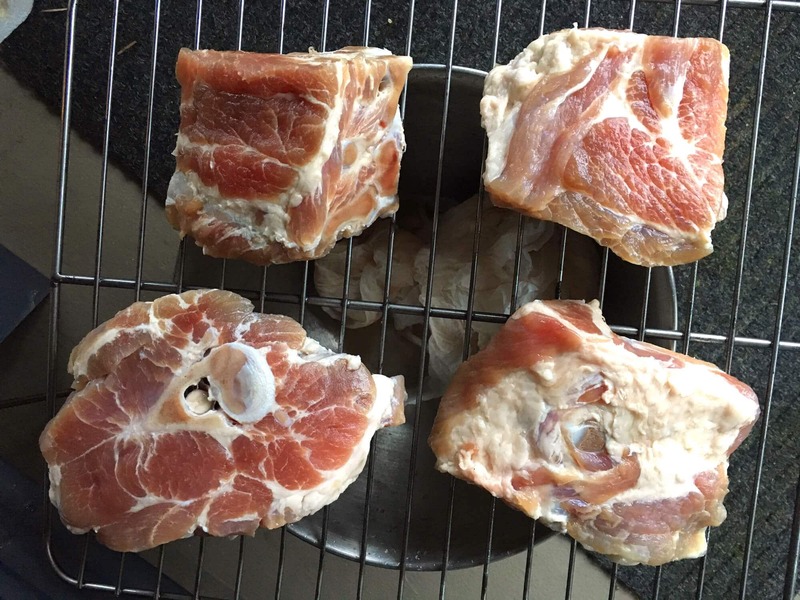 Then place the prepared hocks on the oven rack above it and then roast them at 200 degrees F until they reach that 145 degree F internal temperature. My family would love this! It’s perfect for Father’s Day! I NEED one of those smokers!! Jealous!! This looks really good!! Sounds so flavorful! I will definitely try this! I’ve always wanted to try this and now I think I actually will! I am drooling! Loving the flavor smoking adds to meat. Oh my, this looks So delicious!! My family would LOVE it!! 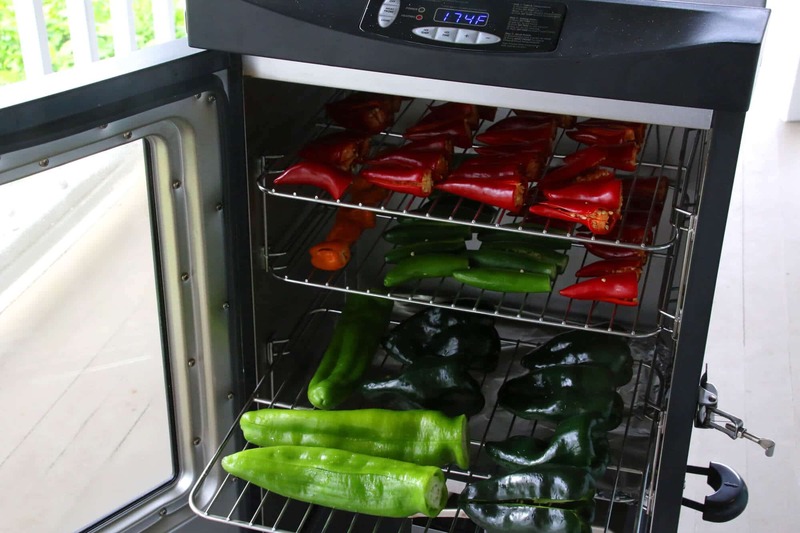 I need a smoker so I can try this – looks amazing! This is such a good tutorial! I’ve never smoked anything, but I need to give it a try. I love how easy this smoker looks to use. I am so jealous of your smoker. I can’t even imagine the elevated flavor by smoking at home! This looks so easy to do with your smoker. I bet your chili was so good – what a great idea to add some of the smoked neck bone! I can just imagine all that great flavor! What a great idea to smoke your own meat! I’m thinking it would be awesome for ribs, too! This just looks and sounds so delicious! I have to try it! I can imagine how much flavor these would lend to a soup. And now I need to get a smoker! We LOVE our Masterbuilt Smoker! Great idea to smoke the ham hocks! Wow, Kimberly, another excellent recipe for me to try. I too have an MES,but it’s the basic version, and I’m still getting used to how to use it as opposed to doing everything on my 22.5″ kettle grill that I usually smoke on. Next thing you know you’re going to be putting a recipe out there for schweinehaxe…..how yummy is that? Hi Ted! The basic version will do a perfect job and I think it’s much easier and fuss-free than the kettle grill. Yes, Schweinehaxe is positively swoon-worthy :) What I will be posting in the future is my recipe for Kasseler (German smoked pork). Have you ever had that? My Oma used to make it for Sunday dinner when we’d come over and it’s just one of the best things ever! Kasseler rippchen? Ausgezeichnet! Down here in the south peninsula of the San Francisco Bay area we have a German butcher shop, believe it or not. It’s the most amazing place and it is a real butcher shop. He’s got a ton of awards for all the different Smoked Meats that he’s done. It’s called Dittmers Wurst-Haus. He’s got kasseler ready to go. now I just need to find the perfect way to cook it. And you, my Goddess of no fail great recipes and cooking methods, can teach me! I’ve had it served to me in a Dutch restaurant….close enough. You are sooo lucky, Ted!! I’ve heard there’s a decent German butcher up in Seattle but I haven’t checked it out yet. And these places usually charge through-the-roof prices. I’m still determined to learn how to master making these these meats and sausages myself. The Kasseler: My Oma would often cook it in the sauerkraut which would infuse the sauerkraut with the most amazing flavor and render the Kasseler nice and tender. Then we’d enjoy the Kasseler with the sauerkraut and potatoes along with her famous Rahmsoße (cream sauce) – simple but heaven! I’m looking for a recipe to cure my own bacon for Xmas. This recipe is the easiest I’ve seen. Just wanted to check something. I dont have a smoker but I can get one built manually. If that fails however, can I roast the brined hocks in the oven until 75C centre temperature and have a safe product ? Hi Paul! Yes, I’m going to be posting my recipe for homemade bacon before too long (both a dry rub and a wet brine version) and it’s equally easy with fantastic results. You can absolutely roast the hocks in an oven, it’s perfectly safe. In fact, I’m going to add these instructions to my recipe – thanks for the reminder. The important thing is simply that you reach that 75C internal temp and you’re good to go. I would place some wood chips in the bottom of a roasting pan (or something like it) on the bottom shelf of the oven and add just enough water to to the pan to moisten the chips without immersing them in water. Cover the pan with aluminum foil creating a tent at the top where the smoke can come out. Then place the prepared hocks on the oven rack above it and then roast them around 93C until they reach that 75C internal temp. Happy smoking! I finished my first batch of neck bones with a couple of ham hocks. Everything went smoothly from the brining to the smoking and aroma in the air outside was amazing :) I added one to a batch of pork and beans for dinner last night and everyone commented on the awesome flavor. I wrapped up the remaining neck bones/hock and froze them. I don’t think they’ll last long before I have to make another batch, lol. Thank you for this great tutorial and recipe! That’s terrific, Tim, thank you! What wood do you use to smoke the neck bones? Hi Jason, I like hickory and apple – they’re both great options for pork. 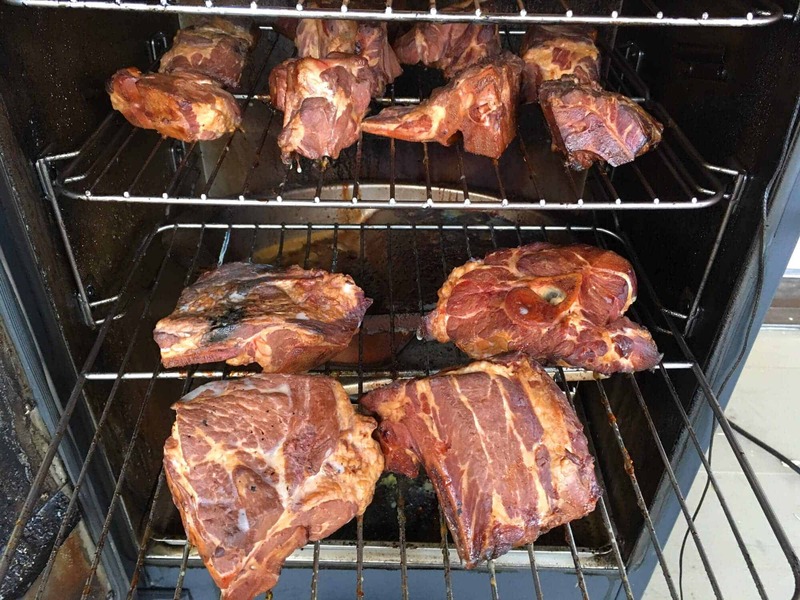 I am trying to find a good recipe for smoked ham ribs ( I am originally from Scotland ) but as yet been unlucky finding one that matches that special flavor as there are so many variations……. Any chance this one would be it? Hi John, I am not sure which specific flavor profile you’re after, but you can definitely use this same method for smoking the ribs.